The head of the Original English Bulldogge is flat and wide with a strong jaw. The jaw has a distinctive undershot bite. The ears are rose shaped. The neck is medium length, heavily muscled and widens toward the shoulders. The forequarters are heavy and have muscular shoulders and strong, straight legs. The body is heavily muscled with a wide chest and a strong brisket. There is a slight downward slope from the hindquarters to the shoulders. The hindquarters are large, muscular and longer in proportion than the forelegs, so as to make the hindquarters higher than the forequarters. The tail is docked for health reasons. The coat is short and smooth. The color is white, white with patches of brindle, black, salmon or fawn, or tricolored (black, white, and tan or brindle). The Original English Bulldogge is loyal, bold and fearless. 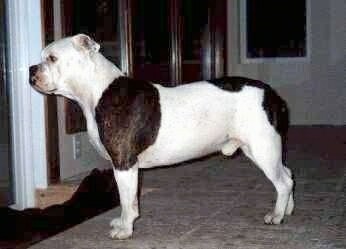 The most important traits for this breed are health, temperament, lifespan and loyalty; appearance is only secondary. This breed does best when it lives indoors and is made an important part of the family. Owners need to take a determined, consistent, loving approach while remaining calm when dealing with this breed. If the dog senses you are weaker minded than he is, he will become stubborn as he will believe it is his job to run the home. They make wonderful pets for the assertive owner who displays the right amount of leadership. Proper human to canine communication is essential. The Original English Bulldogge does best living indoors close to its family. This breed needs to be taken on a daily walk. While out on the walk the dog must be made to heel beside or behind the person holding the lead, as in a dog's mind the leader leads the way, and that leader needs to be the human. 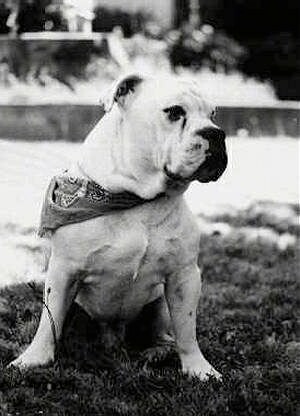 The Original English Bulldogge came with the Wilkinson family in 1946 to Canada from Scotland. It had been kept by the Wilkinson family in Scotland for generations. These dogs are not a re-creation but a true breed, directly descended from the original bull-baiting breed.